The composer Giovanni Croce is someone whose work I suspect few of us have come across in details. This new disc from Outhere Music's Arcana label seeks to remedy that. 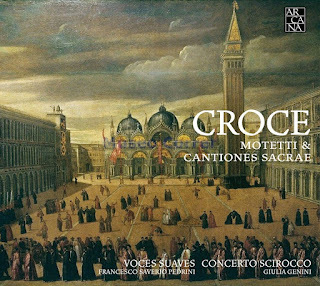 The vocal ensemble Voces Suaves, director Francesco Saverio Pedrini, and the instrumental ensemble Concerto Scirocco, director Giulia Genini, have recorded a programme of Giovanni Croce's motets for eight and for five voices, nine in all, along with instrumental music by Croce's contemporaries. Giovanni Croce (1557-1609) was a colleague and competitor of Giovanni Gabrieli (c1554/57 - 1612), both would work as St Mark's in Venice, the one becoming maestro di cappella and the other organist and principal composer. Giovanni Croce has started as a boy soprano and worked his way upp. Part of this process was regularly publishing works. He seems to have had some sort of understanding with the printer Giacomo Vincenti, a relative newcomer on the scene and keen to establish himself. Finally, in 1603 Croce became maestro di cappella at St Mark's at which point his publishing virtually stopped, having produced 15 collections of sacred music and seven of secular madrigals (he never seems to have written instrumental music). On this disc we have seven eight-part motets from Croce's Motetti a otto voci, Libro Primo (Venice 1594) and two five-part motets from Croces' Sacrae cantiones quinis vocibus concinendae (Venice 1605). The layout of the parts in the double choir motets is reflected in the indications from the Spartitura for the motets, published the same year in a separate edition. So we have two-choir motets where choir one is made up of instruments and singers, and choir two just singers. Croce's style is melifluous and approachable, he writes none of the complexity which makes Giovanni Gabrieli's works so fascinating. And structurally, as Rodolfo Baroncini's excellent booklet note explains, Croce opts for clarity too. I found the results very engaging with the singers making an attractive soft grained sound which blends well with the instruments. The balance is quite natural, without the singers dominating which is probably what happened, but not everyone will perhaps like this consort approach with one person to a part but the results have a lively engaging quality thanks to the energy of the singers. The disc was recorded in the church of Santa Barbara in Mantua, which would have been familiar territory to Croce's younger contemporary Claudio Monteverdi (1567-1643). The choir and instrumentalists use the church space well with its two opposing choir lofts. And, of course, the organ forms a significant component in the motets as well as being a soloist in its own right in Vincenzo Bell'haver's Toccata, Andrew Gabrieli's Canzon ariosa and Claudio Merulo's Toccata Terza. The instruments also get their moments of glory with the instrumental works by Giovanni Picchi, Giovanni Gabrieli and Giosetto Guami, which form a nice contrast with the vocal works. In every age, we have a tendency to focus on just one or two composers. This disc reveals that the sound of St Mark's wasn't just the gorgeous complexity of Giovanni Gabrieli but was also the melifluousness of Giovanni Croce's music too. This is an immensely fascinating and valuable disc, and a most enjoyable one as the performers clearly revel in the lovely textures which Croce creates. This is an important disc, one which sheds light on the wider musical activity in Venice rather than concentrating on the big names. Giovanni Croce's music is well worth discovering .